I truly have the best job at Microsoft: Make our customers happy, specifically through community channels. What does that entail on a daily basis? Looking at the telemetry from our support cases, assist our user group leaders with their group efforts, and my favorite part work with our MVPs. These people are basically super hero’s that use their Powers helping people with technology. With a peer group like Paul, Marco, Ginger, Greg, Seth, Chris, Ken, Jen, Matt etc etc there is no way to pick a favorite….but between organizing the Definity Conference, presenting a bunch of sessions at SQL Saturday Melbourne, tomorrows Webinar and his latest effort a 900+ page book he made free (all in the last 3 weeks!) 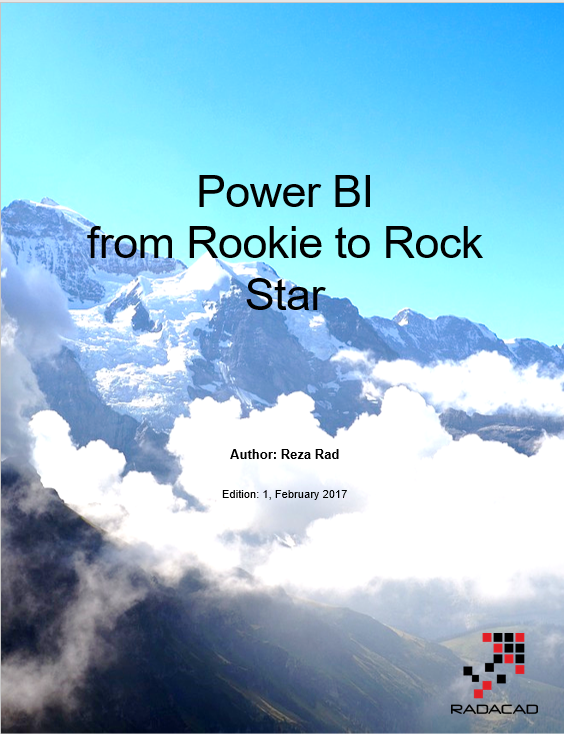 it is hard not to put Reza Rad on the top of the Power BI MVP pack! So what about this book? Back to the subject of this post! Reza’s day job is take take the most difficult data challenges and turn them from a storage and IT overhead and cost into business insight. This book is a distillation of this learning starting with getting started with the product all the to advanced data manipulation with the M Language and DAX queries. While the table of contents is subject to change i have included it due to the fact the hyperlinks are to blog posts that are amazingly valuable! Stacked Chart or Clustered, Which One is the Best?